Nothing says romance like a beautiful bouquet of flowers on Valentine’s Day, however Interflora's Valentine’s Day ‘Ultimate Love Bouquet‘ - inspired and endorsed by the RHS(Royal Horticultural Society) - received so much backlash on Twitter that the flower company had to do a U-turn on certain claims they had made. This marvelous bouquet that contains ten different varieties of flowers – with every single flower chosen because of its symbolism - and costing a whopping £195 - vase included, seemed to indicate that 60% percent of the flowers were UK grown. This claim whipped up the members of the very passionate and vocal British flower growing industry and gardening fans in the Twittersphere who suggested that a big part of the flowers in the bouquet couldn't have been British grown because it lacked seasonality, so the flowers had to been imported. Interflora was forced to ditch their ‘British’ claim because they "could not guarantee the source" of their flowers, admitting that the red and pink roses, the lilac and agapanthus and amaranth were imported and a spokesperson for the company added that they also removed British grown tag from the bouquet. Grower Gill Hodgson of The Flower Farm in York told Horticulture Week: "Interflora has really shot themselves in the foot by claiming their flowers are British-grown. And the RHS are the main British gardening organisation and they should be promoting British growers and not endorsing a product that appears to be predominantly imported. To see the RHS championing scentless flowers mass-produced in Holland is soul-destroying. "There's a dearth of young growers and the RHS itself has a dedicated schools' division to encourage new entrants and yet on Valentine's Day - one of the peaks in the growers' year - they promote imported produce." Covent Garden Flower Market British-grown specialist Pratley Flowers also reported that even the red chrysanthemums, the myrtle and white hyacinths are only available from overseas at the present time. 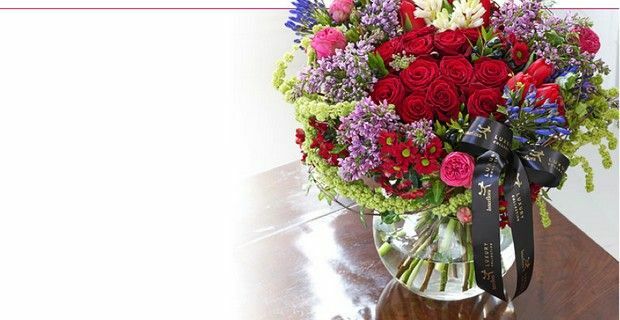 A percentage of funds raised from Interflora’s bouquet will go towards RHS charitable activities.